To turn on the Delphin, locate the power button on the side of the device. Press and hold this button for a few seconds until you see the Underwater Audio logo appear on the screen. The Delphin will cycle through instructional graphics on the screen for about a minute until the Delphin has finished booting. Left Pointing Arrows (Rewind): this will jump to the previous track. If the button is held down, the Delphin will go into volume mode and the your headphones will emit a ding sound. In volume mode, this button will lower the volume with each press. Right Pointing Arrows (Fast Forward): this will jump to the previous track. If the button is held down it will go into volume mode and the your headphones will emit a ding sound. In volume mode, this button will raise the volume with each press. Power: Press and hold for several seconds to power the Delphin on or off. This button also functions as a screen lock to turn the screen display on and off when pressed once. Back: Press this button to go back to the previous screen. Press and hold this button to return to the home screen. The headphone/charging cord jack is also located on the side of the Delphin. The Delphin has a touch screen. To navigate the Delphin, swipe your finger to one side to switch screens and reveal the other apps. To click on something, simply press the screen with your finger. Swipe down on the screen to see any notifications on your device. If you swipe down from the top of the screen, you should see a blue bar on the appear with the battery level, and connection status for both Bluetooth and WiFi. If you swipe down a second time, the notifications screen will appear. If you click on the person icon in the top right, you can change Bluetooth and Wifi settings as well as portrait/auto-rotate settings for the Delphin screen. The apps in this photo do not come pre-loaded on the Delphin and will need to be downloaded. 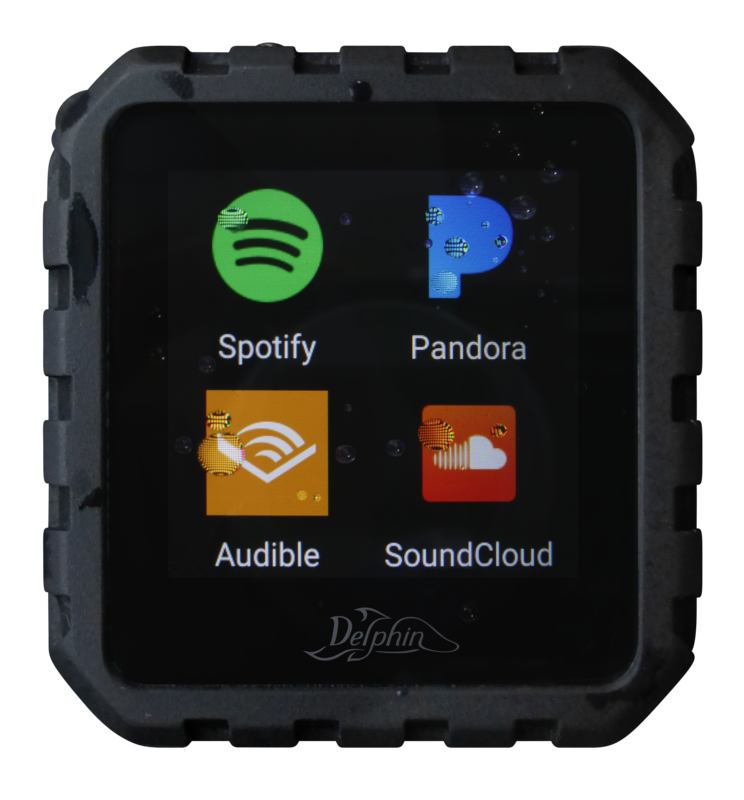 The Delphin can hold a variety of apps on the device. It comes pre-loaded with some you may need, but if you would like to install additional apps, you’ll need to do that seperately using the "Get Apps" app. To see a more detailed account of what it’s like to use various popular apps on the Delphin, click here to visit our Delphin Apps blog article. Browser: This app is an internet browser you can use to navigate anywhere on the web. File Manager: This app enables you to see every file stored on the Delphin. It will tell you how much space is available on the device. Music: You can play music stored directly on your Delphin using this app. Settings: Here you can manage sound, display, WiFi, Bluetooth, battery, uninstalling apps, privacy, language, factory reset, and view info about the device. Deleting an app: To delete an app, press and hold the app icon until a “remove” prompt shows up on the top of the screen. Once you press this, the app will no longer be on your device. The Delphin will need to charge after about 4 hours of usage (depending on the activities run on the device). To charge the device, connect the power cable into the headphone jack of the Delphin and connect the USB end of the cord to a USB charging port.